Note: On January 29, 2016, the Texas Historical Commission approved the Official Texas Historical Marker for the Lake Creek Settlement. The Lake Creek Settlement marker will be dedicated in late 2016 or early 2017. "Montgomery’s second high school is set to open at the beginning of the 2018-2019 school year and will be named Lake Creek High School. The earliest Anglo-American settlement in Montgomery County was called the Lake Creek Settlement. The Lake Creek Settlement was part of Austin’s Colony in the Mexican State of Coahuila y Tejas. After the Texas Revolution, the City of Montgomery was founded in the middle of Lake Creek Settlement in 1837. The Montgomery ISD boundary lines and that of the original Lake Creek Settlement are almost identical." Below is a scan of the "Articles of Agreement" made between Jacob Shannon and his sister, Rutha (Ruth or Ruthy) Shannon Miller. Jacob Shannon received a land grant for a league of land from Empresario Stephen F. Austin in 1831 which was commonly known as the Beadye [Beadie] League. Articles of agreement made and entered into between Jacob Shannon of the one part and Rutha Miller of the other part both of the Colony and Settlement aforesaid, Showeth that the said Jacob for and in consideration of an agreement entered into heretofore the said Jacob is to let the said Rutha have the one half of his said League of land lying in said neighborhood, the said Rutha having paid the one half of the expense, said League which League being known by the name of Beadye on which the parties now settled so as to be divided as to the equal to both of the parties in soyal, water and timber, all of which League is held by the said Jacob by grant from the Government of which said Jacob has disposed to Mathew Hubert three hundred and fifty acres of English measure of which each of the parties is to deduct from the agreement from their said half, or to divide the residue after deducting the three hundred and fifty acres then to be divided as above, in witness whereof we hereunto set our hands and affix our seals. Montgomery County Deeds, Vol. N, page 254. Witnesses to the signing of this document in the Lake Creek Settlement were Mathew Hubert and John Shannon. "Jan 13. Thomas Chatham from the State of Alabama. 33 years old. Ditha his wife 23 years old. 1 Male child 3 female do. Occupation farming. Applies for 4 quarters of league in Lake Creek settlement, marked J. M. Springer who relinquishes in favor of Chatham. [In pencil] Relinquishes first selection and applies for vacant land between Austin and Greenwood. See Stephen F. Austin's Register of Families, Book 2, Page 7, Texas General Land Office, Austin, Texas. Thomas Chatham's land grant is located close to the center of the Lake Creek Settlement directly below the John Corner League on the map showing the boundaries of the Lake Creek Settlement. The inventory is signed by Marget Shannon, widow of the Deceased Owen Shannon; Jacob Shannon, Administrator; Jesse Grimes, Mathew Hubert and W. W. Shepperd, Appraisers; and Joseph Lindley and J. H. Shepperd, Assisting Witnesses. Jacob Shannon was appointed the Administrator of his father's estate. Also see the 1833 Articles of Agreement between Jacob Shannon and Rutha Miller above and the Affidavit of Jacob Shannon in the 1870 Mathew Cartwright Pension Application below. Witnesses to the signing of Owen Shannon's will were Henry Goff, Mary Corner, Matthew Hubert, James J. Foster, William C. Clark, Benjamin Rigby and George Allen. On the map above, notice the location of the Mary Corner, James J. Foster, William C. Clark and Benjamin Rigby land grants in relation to the Owen Shannon League. This Will is dated April 12, 1835, but the year has to be incorrect. The probate of Owen Shannon's Will began on June 9, 1834. Jacob Shannon sought the administration of his father's estate on February 24, 1835. Owen Shannon almost certainly executed his Will on April 12, 1834 and died between that date and June 9, 1834. Click here to see additional probate documents showing that the will was probated in the Department of Bexar and Jurisdiction of Austin. Owin (Owen) Shannon's will and probate papers are located in Austin County Clerk's office in a file referred to as the "Old Probate Files." The Owen Shannon probate file is File 41(11). Also see The Herald, Volume 24, Issue Number 4, Winter 2001, "Owen Shannon’s Grave," by Harry G. Daves, Jr., pp.161-169 which contains a complete transcription of Owen Shannon's Will. At the house of Charles Garrett in the Precinct of Lake Creek upon San Jacinto, Before the witnesses C. B. Stewart and Henry Goff, I Margaret Shannon do declare that Owen Shannon deceased my late husband did in his life time donate and give in fee simple and perpetual right to the citizen above named Charles Garrett one quarter of a League of Land , granted to him the said Owen Shannon as a colonist by the State of Coahuila and Texas. Charles Garrett, a member of Austin's "Old Three Hundred," was Margaret Shannon's son-in-law. Garrett was married to Nancy Shannon. Margaret Shannon was the wife of Owen Shannon and she was executing a deed regarding Owen Shannon's real property in the "Precinct of Lake Creek." This deed was executed by Margaret Shannon on September 17th, 1835. Witnesses to the signing of this document were C. B. Stewart and Henry Goff. See page 23, Washington County Clerk, Deed Book A-1. Page 23 of Washington Conty Deed Book A-1 is a list of "Records by C B Stewart" recorded with the Washington County Clerk's Office. This is a record of a deed for a half of a League from John Corner to C. B. Stewart dated September 20, 1835 and recorded on November 19, 1836. In addition to his many other activites, C. B. Stewart was also a land speculator. Between October 11, 1835 and October 31, 1835, the Permanent Council was effectively the government of Texas. R. R. Royal, the President of the Permanent Council of Texas in San Felipe, wrote a letter to General Stephen F. Austin and General Sam Houston at the headquarters of the Texas army in Bexar (San Antonio) on October 31, 1835. In his letter he strongly encouraged the army to hold its ground. In this letter, Royal promised more supplies and advised of reinforcements from Lake Creek. "...Reinforcements are coming from every Quarter and If you but Just hold on a little San Antonio must fall Just at the sight as If it were of your superior numbers. If you or a portion of you leave it will discourage and prevent the Reinforcements now getting up in all parts of the Country 75 men from N. Orleans, in complete uniform have Just left Brazoria and will soon Join you an Express from Lake Creek says in a few days 50 men from that Quarter will leave for head Quarters men from Nacogdoches came in today and from all accounts we expect a great many more from there in a few days." From The Papers of the Texas Revolution 1835-1836, Presidial Press, Austin, 1973, Vol. 2, pp. 279-281. Also see Barker, "The Austin Papers," Vol. III, pp. 223-224. Some of the men who served as reinforcements "from Lake Creek" appear in many of the documents that follow below. The condition of the above obligation is such that whereas: the above named W. W. Shepperd, has this day purchased of me, the Said Busby, all my right, title, claims and interest to my one half league, in Vehleins Colony, on the East San Jacinto. Now if the Said Wm Busby, shall by the first of March next, cause to be made, or to make to the Said Shepperd, or his assigns, a good and lawful title to the above described land, then this bond to be void, otherwise to remain in full force and virtue in law, this day and date above written. See Montgomery County Clerk, Deed, Vol. A., pp. 61-62. William Busby executed a bond in favor of W. W. Shepperd in Lake Creek, Austins Colony, Texas on November 4, 1835. Lake Creek Settlement settler, James J. Foster's name appeared in the newspaper on January 16, 1836 as a "commissioner for organizing militia" for the Jurisidiction of Washington. He was appointed by the General Council on November 28, 1835. The following named gentlemen have been appointed by the council to several offices designated. L. C. Manson, first judge, Robert Mills, second ditto. J. S. D. Byrom, Matthew Patton, and James O'Connor, commissioners for organizing the militia. James Hall, first judge, Hugh M'Guffin, second ditto.James J. Foster, John W. Hall, and Asa Mitchell, commissioners for organizing militia. See the January 16, 1836 edition of the Telegraph and Texas Register newspaper, published in San Felipe de Austin, Vol. 1, No. 13, p. 1, c. 1. See December 12, 1835 edition of Telegraph and Texas Register, published in San Felipe de Austin, Vol. 1, No. 9, p. 2, c. 1. On December 10, 1835, the General Council of the Provisional Government appointed a number of men to assist Col. James Fannin to "collect reinforcements" for "aiding in the reduction of Bejar." The man appointed to collect reinforcements in Lake Creek was James J. Foster. At some point, James J. Foster resigned. See the 1870 Affidavit of Jacob Shannon near the end of this chapter. Despite Foster's resignation, militiamen from the Lake Creek Settlement would fight in the Battle of Concepcion, the Grass Fight and the Siege of Bexar in the first stage of the Texas War for Independence. Captain John Bradley signed at least three honorable military discharges in Lake Creek in December of 1835. The men discharged were Hiram Brumet, Christopher Yocum, and Henry Peace. Special thanks to Daniel A. Hill for locating two of these (Yocum and Peace) Lake Creek Settlement documents. I was reading a draft of his forthcoming book about Texas founding father Martin Parmer when I read about the Yocum and Peace documents. This is to Certify that Hiram Brumet Joined my Company on the 4 day of (ink smeared but probably October) Discharged His Duty faithfully as a Private and is hearby honorably Discharged. Texas State Library and Archives, Republic Claims, Name: Clark, William C., Claim #: 1242, Type: AU, Reel #: 18, Frames: 134. This is Hiram Brumet's discharge from the army of Texas following his service in the Siege of Bexar (San Antonio). This discharge is interesting because Captain John M. Bradley signed it in Lake Creeke. As will be seen below, Brumet served in the Texas army as a substitute for William C. Clark. See 1836 Hyram Brumet to William C. Clark document below. William C. Clark was one of the original colonists/settlers in 1831. The W. C. Clark League is located on the map above between the W. Atkins League and the west fork of the San Jacinto River. This document, uncovered by Daniel A. Hill of Irvine, California, is located at Texas State Library and Archives, Republic Claims, Name: Clark, William C., Claim #: 1631, Type: AU, Reel #: 119, Frame: 9. This document, uncovered by Daniel A. Hill of Irvine, California, is located at Texas State Library and Archives, Republic Claims, Name: Clark, William C., Claim #: 994, Type: AU, Reel #: 81, Frame: 593. The public are hereby cautioned against buying, bargaining, or trading for a note of one thousand dollars, held against me by Col. Jared Groce, as I have just claims aginst that gentleman. Certain papers may be exhibited by him, to prove the justice of the note, which I can prove were not legally obtained. Telegraph and Texas Register, Thursday, March 17, 1836, Vol. I, No. 20, published at San Felipe de Austin by Joseph Baker & Bordens. This notice ran at least one other time in the Telegraph and Texas Register on March 24, 1836, Vol. I, No. 21, published at San Felipe de Austin by Joseph Baker & Bordens. W. W. Shepperd and Col. Jared Groce were cousins and had extensive business dealings with one another. Here on February 12, 1836, Shepperd is residing in the place known as Lake Creek. William W. Shepperd had been operating a store and living on two hundred acres of land in the John Corner League which he purchased from William C. Clark in 1835. These two hundred acres of land would be developed into the town of Montgomery in July of 1837. W. W. Shepperd and his family were the first residents of what would become the town of Montgomery. I hereby certify that I served as a substitute in the Texas Army for the Bearer Wm. C. Clark, during the Fall Campaign against San Antonio, and that I hereby transfer to him all the right, title and interest in and to a discharge received for said services in my name. Given at Lake Creek on the Day and date above written. Texas State Library and Archives, Republic Claims, Name: Clark, William C., Claim #: 1242, Type: AU, Reel #: 18, Frame: 135. On March 1, 1836, at Washington (Washington-on-the Brazos), the Texian Independence Convention began. The convention lasted from March 1 to March 17, 1836. The delegates to the convention declared Texas independent from Mexico on March 2, 1836. One of these delegates was Charles B. Stewart. Stewart, who had already served as the first Secretary of State of Texas, was an active member of the convention where he signed the Texas Declaration of Independence and was a member of the committee that drafted the Constitution of the Republic of Texas. Later, historians would credit him with designing the Lone Star flag and Seal of Texas in the Town of Montgomery, Texas in 1839. To W W Shepperd Esqr. As seen above, W. W. Shepperd's house and store were located on the two hundred acres of land in the John Corner League which Shepperd had purchased in 1835 from William C. Clark. So C. B. Stewart and Julia T. Shepperd were married in the Lake Creek Settlement on the lands that would later become the Town of Montgomery in July of 1837. As will be seen later, it is important to note that three of the witnesses to the marriage were John Marshall Wade, Charles Garrett and William C. Clark. Stewart then returned to the Convention at Washington by March 16 where he signed the Constitution of the Republic of Texas on March 17, 1836. Below is a letter written by C. B. Stewart on the day he returned to the Convention at Washington (March 16, 1836) describing the fall of the Alamo and the desperate situation in Texas. See the Tuesday, April 26, 1836 edition Richmond Enquirer newspaper published in Richmond, Virginia, Vol. 32, No. 117, p. 4. The account of James Hall authorizing "W. W. Shepperd of Lake Creek to celebrate a contract of marriage between Chas. B. Stewart and Julia Shepperd" was published for the first time by Louis Wiltz Kemp in his book, The Signers of the Texas Declaration of Independence. Kemp's book was originally published in in 1944 and later republished in 1959. See pages 333-334 for the account of Stewart/Shepperd marriage. He [Sam Houston] then said, "My friends, I am told that evil disposed persons have reported that I am going to march you to the Redlands. This is false. I am going to march you into the Brazos bottom near Groce's, to a position where you can whip the enemy ten to one, and where we can get an abundant supply of corn from Lake creek." J. H. Kuykendall, "Recollections of the Campaign," quoted in Eugene C. Barker's "The San Jacinto Campaign,"Quarterly of the Texas State Historical Association, Volume IV, p. 300. Two of these men, Martin P. Clark and George Galbraith, would serve as Commissioners on the first Commissioners Court of Montgomery County held on March 1, 1838. At the store of William W. Shepperd on Lake Creek on the 24th day of June 1836. Before us the undersigned, Witnesses, who authenticated this title at the request of the parties interested there being no Judge or notary present, Appeared Benjamine Rigby a Citizen of Austin's Colony who declared that in fullfillment of a contract made and entered into on the 25th day of April 1835 with Chas B. Stewart also a ..."
See Montgomery County Clerk, Deed, Vol. B., pp. 268-270. Deed executed " The witnesses to this deed were W. W. Shepperd, John Wade and William Rankin. Witnesses to the original contract on April 25, 1835 were James Buckhanon [possibly Buchannon] and John Geline [or Giline]. C. B. Stewart made this entry on June 25, 1836 in hisDay Book from 1836 to 1852. Charles Bellinger Stewart Papers, Texas State Library and Archives, Austin Texas. Note C. B. Stewart makes no mention of any place called Montgomery in his "Day Book" prior to July 8, 1837. It is also interesting to note that the July 8, 1837 advertisement for the Town of Montgomery from the Telegraph and Texas Register newspaper (see at the beginning of this article) was cut out and glued to the inside front cover of C. B. Stewart's Day Book from 1836 to 1852. There are many other references to Lake Creek in Stewart'sDay Book, space on this page does not allow for scans of all of them. For instance, there a couple of pages of land transactions in Lake Creek involving C. B. Stewart and Charles Garrett (Owen Shannon and Margaret Montgomery Shannon's son-in-law). The Allen brothers founded the Town of Houston, Texas. On August 30, 1836, the advertisement below was placed by the Allen brothers with the Telegraph and Texas Register newspaper published in Houston, Texas. The town of Houston is distant 15 miles from the Brazos river, 30 miles, a littler North of East, from San Felippe, 60 miles from Washington, 40 miles from Lake Creek, 30 miles South West from New Kentucky, and 15 miles by water and 8 or 10 by land above Harrisburg. Here the new Town of Houston is described as being located 40 miles from Lake Creek. It is clear from the context that the Allen brothers are referring to the place known as Lake Creek and not the stream known as Lake Creek. The Lake Creek Settlement was known well enough that the Allen brothers used it as a reference point to describe to people where the new Town of Houston was located. This is an excerpt from the letter written by the Allen brothers to the Congress of the Republic of Texas promoting Houston as the capital of the Republic of Texas in 1836. Houston became the capital of the Republic of Texas from 1837 to 1839. The Spring and Lake creek settlements are specifically referred to in the letter. ...This town is situated at the head of navigation — in the very heart of a rich country. It was selected as a town which must become a great interior commercial emporium of Texas. The trade of upper Brazos, the Colorado, of Trinity and San Jacinto rivers, of Spring and Lake creek settlements, must find its way into Galveston bay through the town of Houston. "John K. Allen, for A. C. & J. K. Allen. Houston, A History and Guide, Compiled by Workers of the Writers’ Program of the Work Projects Administration in the State of Texas, Sponsored by the Harris County Historical Society, Inc., The Anson Jones Press, Houston, Texas, 1942, pp. xi and xii. Know all men by these presents, that I, Wm. C. Clark, of Lake Creek, Municipality of Washington, and Republic of Texas, do hereby nominate, constitute, and appoint Young Carrethers of the precinct, municipality, and Republic above mentioned, my true and lawful Attorney to transact all business with the proper authority of this Republic relative to a discharge from the Army of Texas, belonging to Hiram Brumet: transferred by said Brumet to me. And I Wm. C. Clark do by these presents agree to let the said Carrethers receipt, for any papers, which may come from the Government aforesaid, or its legal officer - and bind myself to abide by his transactions for me in this matter in all respects. And I hereby empower him (if he sees proper) to sell, convey or otherwise dispose of said discharge, and the accompanying papers. Texas State Library and Archives, Republic Claims, Name: Clark, William C., Claim #: 1242, Type: AU, Reel #: 18, Frame: 132. Special thanks to Charlene Grafton, a descendant of William C. Clark, who discovered this document. This document led to the discovery of two other documents in this paper: 1835 Military Discharge of Hiram Brumet and 1836 Hyram Brumet to William C. Clark, which were also executed in Lake Creek. ...the conditions and stipulations herein contained, they bind themselves, the one to the other in the penal sum of Ten Thousand Dollars. Done in Lake Creek before the witnesses at the end. This 10th day of December 1836. John M Springer to Jeremiah Worsham, Montgomery County Deeds, Vol. A, pp. 3 and 4. This December 10, 1836 deed executed in Lake Creek was recorded on January 31, 1838 in the "old town" of Montgomery. John M. Springer was married to Elizabeth Landrum the daughter of Zachariah Landrum. Jeremiah Worsham was married to Catherine Landrum also the daughter of Zachariah Landrum. For more information on how the Landrum, Worsham, Springer and Rankin families mentioned throughout this article were related, click here. Zachariah Landrum's League is just west of the John Corner League where the Town of Montgomery would be founded in July 1837. Six months before the town of Montgomery was founded, John M. Springer and Jeremiah Worsham were conducting business in Lake Creek. It is also important to take note of the witnesses to this deed who also believed they were witnessing a deed in Lake Creek: B. B. Goodrich, Mathew Hubert, William Keys, Wm. C. Clark and Wm. Cartwright. Note on the map the location of the William C. Clark and William Cartwright land grants and their close proximity to the John Corner League. Also, see the reference to Mathew Hubert in the Jacob Shannon to Rutha Miller Articles of Agreement, above, which was executed in Lake Creek Settlement in 1833. On the 29th November, on Lake Creek settlement, Ann Rebecca, youngest daughter of William and Ann Mock, aged one year. C. B. Stewart made this entry on January 5, 1837 in his business journal titledDay Book from 1836 to 1852. Charles Bellinger Stewart Papers, Texas State Library and Archives, Austin Texas. Note C. B. Stewart makes no mention of any place called Montgomery in his "Day Book" prior to July 8, 1837. Captain John Crane was a soldier in the Texas Revolutionary army who fought in the Siege of Bexar and later served in John Marshall Wade's cavalry company. John Crane was killed in the Cherokee War in 1839. Click here to see a note executed by John Crane in 1838 in Montgomery which was probated by C. B. Stewart as attorney for W. W. Shepperd in 1840. Montgomery County Clerk, Deeds, Vol. L, p. 359. Both John N. Thomas and James Thomas were parties to this bond. Click here for an in-depth history of the Thomas Family as it migrated from South Carolina across the southern United States including Alabama and into the Lake Creek Settlement in Mexican Texas. Lou Poole has been kind enough to supply an excellent history of the Thomas Family for presentation here on the Texas History Page. Special thanks to Lou Poole for allowing the Texas History Page to present this newly revised article in its entirety. Note that theThomas family was closely related by multiple marriages to the Springer, Landrum andGilmore families. This article should assist all historians and genealogists researching these four families. This is a large pdf. file, so please be patient while downloading. Lake Creek January 10th 1837. Montgomery County Clerk, Deeds, Vol. B, p. 407. Witnesses to this deed were J. Worsham (Jeremiah Worsham), W. M. Rankin, Zacheus Wilson and William Keys. Click here for an in-depth history of the Thomas Family as it migrated from South Carolina across the southern United States including Alabama and into the Lake Creek Settlement in Mexican Texas. Lou Poole has been kind enough to supply an excellent history of the Thomas Family for presentation here on the Texas History Page. Special thanks to Lou Poole for allowing the Texas History Page to present this newly revised article in its entirety. Note that the Thomas family was closely related by multiple marriages to the Springer, Landrum and Gilmore families. This article should assist all historians and genealogists researching these four families. This is a large pdf. file, so please be patient while downloading. Montgomery County Clerk, Deeds, Vol. L, pp. 357-358. Click here for a well researched article about the Thomas Family written by Lou Poole which includes additional information about Lake Creek Settlement settler, David Thomas. This is a large pdf. file, so please be patient while downloading. Montgomery County Deeds, Vol. A, pp. 50-53. Witnesses to this deed include R. M. Cravens, William Keys, Thomas Adams and C. B. Stewart. See Washington County Clerk, Deed Book A-1, pp. 36 & 37. Another legal document executed at "the store of W. W. Shepperd on Lake Creek." Montgomery County Deeds, Vol. H, p. 133. "Done in the settlement of Lake Creek before the witnesses in the Year of our Lord Eighteen Hundred and thirty seven and on the 18th of the month of January. -A. U. Springer-" Again, take note of the witnesses: Zaheus (Zacheus) Wilson, John M. Springer, William Landrum, James P. McFarlan (McFarland), Thomas Chatham. A. U. Springer acknowledged his signature on this deed on November 25, 1843 before the Montgomery County clerk and the Deed was filed of record on November 28, 1843. See Montgomery County Deeds, Vol. H, p. 134. Texas State Library and Archives, Republic of Texas Election Returns 1835-1845, Box 2-9/44, 1837 - Washington Co. This is a wonderful record from the Texas State Archives. It shows the precincts in Washington County in 1837 before Montgomery County was created. Six precincts are listed: Hazard, Hidalgo, Washington, Lake Creek, San Jacinto and Viesca. As we will see below, three of these precincts will be located in the new County of Montgomery when it is created later in December of 1837. Jer. Washam (Jeremiah Worsham) and Geo. (George) Galbraith were elected as Justices of Peace in the Precinct of Lake Creek. Both of these gentlemen appear in numerous documents associated with the Lake Creek Settlement. Another entry from C. B. Stewart's Day Book from 1836 to 1852. Charles Bellinger Stewart Papers, Texas State Library and Archives, Austin Texas. This entry dated February 28, 1837 refers to medical advice and treatment provided by C. B. Stewart in Lake Creek. The William Landrum League is located next to the Benjamin Rigby League due west of the Owen Shannon League. See the map above. This entry appears at the top of page 34 of C. B. Stewart's Day Book from 1836 to 1852, Charles Bellinger Stewart Papers, Texas State Library and Archives, Austin Texas. Pages 34 and 35 contain a number of joint business dealings between Charles B. Stewart and Charles Garrett in Lake Creek. It should be recalled that Charles Garrett was the son-in-law of Owen Shannon and Margaret [Montgomery] Shannon. Texas State Library and Archives, Republic Claims, Name: Stewart, Charles B., Claim #: 965, Type: AU, Reel #: 101, Frames: 25-30. You can look these records up online at: http://www.tsl.state.tx.us/arc/repclaims/index.php James Lee served as a Sergeant in Captain William Ware's Company. His army discharge papers were signed by John Marshall Wade. James Lee sold his claim for three months service in the army of the Republic of Texas to Charles B. Stewart on March 6, 1837. Stewart purchased army discharge papers from several veterans of the Texas Revolution. Here we find an example of George Galbraith as Justice of the Peace of the Lake Creek District. Montgomery County Clerk, Deeds, Vol. B, pp.221-223. Witnesses to this bond were Charles Garrett and B. B. Goodrich. Another entry from C. B. Stewart's Day Book from 1836 to 1852, page 34. Charles Bellinger Stewart Papers, Texas State Library and Archives, Austin Texas. 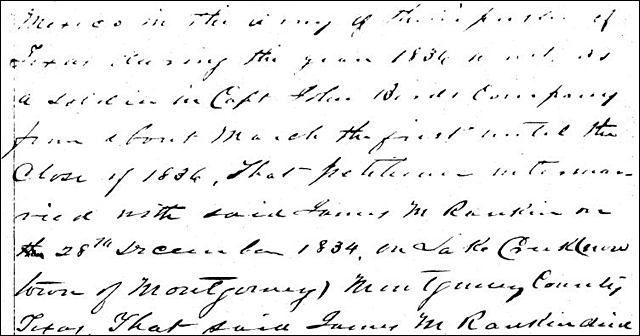 Given its location on the page, this entry was made between March 8 and March 15, 1837. This is an example of a joint account of Charles Garrett and Charles B. Stewart in Lake Creek. Drew on Judge Hall to be paid out of my store in favor of the order of Chas Garrett for three hundred Dollars in 4 Dfts for $50 each and 4 Dfts for $25 each. these to be given as premiums on joint a/c to persons who may wish their lands cleared out. Should Mr Garrett pay me the cash for one half of each or all of these Dfts the goods advanced upon the said half shall be put to him at cost and cartage and Should he pay property upon paying my half in cash I am to have my half in the same manner. Another entry from C. B. Stewart's Day Book from 1836 to 1852, page 34. Charles Bellinger Stewart Papers, Texas State Library and Archives, Austin Texas. This is another example of a joint account of Charles Garrett and Charles B. Stewart in Lake Creek. Following the Texas Revolution, the Lake Creek Settlement was located in Washington County until Montgomery County was created on December 14, 1837. The WPA (Works Progress Administration) transcribed the minutes of the Washington County Commissioners' Court from April 3, 1837 to January 7, 1846. These transcriptions can be found in the archives of the Dolph Briscoe Center for American History at the University of Texas in Austin, Texas. The original minutes of the Washington County Commissioners' Court from this period (Republic of Texas) are no longer located within the Washington County Clerk's Office so historians are very fortunate that the WPA preserved these records by transcribing them during the Great Depression. See File # 4E 418, "WPA Historical Records Survey - Washington Co. - Min. Comm. Court," 2. Book I, (Carbon & MSS). Washington County, Book 1 (4-3-37 - 1-7-46), Minutes Commissioners Court. The first meeting of the Washington County Commissioners' Court was held on April 3, 1837. Washington County, Texas was created in 1836 and was organized in 1837. See February 13, 1837 election returns above. The first Washington County Commissioners' Court meeting was held on Monday, April 3, 1837. Many references were made to the Lake Creek Settlement in the first nine pages of the minutes of the Washington County Commissioners' Court. At the first meeting on April 3, 1837, Justices of the Peace Jeremiah Worsham and George Galbraith represented the precinct of Lake Creek. Minutes of the proceedings of the Court of Commissioners of Roads and Revenue in and for the County of Washington. In pursuance of an "Act organising Justices' courts, and defining the power and Jurisdiction of the same; and also Creating and Defining the Office and powers of Commissioners of Roads and Revenue," passed December 20, 1836. and also, of an "Act authorizing and requiring County Courts to Regulate Roads, appoint Overseers, and Licence &c. the members composing said Court in and for the County of Washington assembled at the Court house of said County in the Town of Washington on Monday the third day of April A. D. 1837. Members present, The Hon. Jno. P. Coles Chief Justice. Subal Marsh J. P. for the precinct of Hidalgo. John Beauchamp and Gedeon Walker JS P. for the precinct of Hayard [Hazard] Stephen R. Roberts J. P. precinct of Washington. Jeremiah Washam [Worsham] & George Galbraith J'sP. precinct of Lake Creek William Robert and William Robinson J's p precinct of San Jacinto. Hugh McGuffin J. P. precinct of Viesca. At this meeting, Justice of the Peace/Commissioner George Galbraith from the Precinct of Lake Creek made a motion to lay a road from the Lake Creek Settlement to the City of Houston. See File # 4E 418, "WPA Historical Records Survey - Washington Co. - Min. Comm. Court," 2. Book I, (Carbon & MSS) located in the Dolph Briscoe Center for American History at the Unversity of Texas, Austin. Also see Washington County Texas Court of Commissioners of Roads & Revenue 1836-1846, originally transcribed by the WPA, 2001, GTT Books, Indexed by Pat Gordon 2002, pp. 1 & 2. The next day, April 4, 1837, Justice of the Peace/Commissioner William Robert from the Precinct of San Jacinto moved that the road from the Lake Creek Settlement to the City of Houston be continued north from the Lake Creek Settlement to the town of New Cincinnati. On motion of William Robert. Resolved that the road from the City of Houston to Lake Creek Settlement be Continued to run North from Lake Creek Settlement in the most direct and practicable rout to New Cincinnatti on the Trinity and that William Clark Job Collard H. M. Crabb John Caruthers and Ranson Alfin be appointed to survey said rout and report to this court at the next regular term thereof. On motion of William Robert. Resolved that a road be laid out from Baptiste Village to intersect the road from New Cincinnatti to Via Lake Creek to the City of Houston and that Ralph McGee Joshua Lumley Harriss Elisha Collard and John Corner be appointed to survey said rout and report to this Court at the next regular term. It is important to note that a place called "Montgomery" does not appear in the Washington County Commissioners' Court Minutes for the first time until October of 1837, three months after the Town of Montgomery was founded. For the sum of Eight dollars to me in hand paid by Charles B Stewart, I sell and convey to him all my claim and right to one month and seventeen days service in the volunteer army of Texas at San Antonio upon which there is a pay of Twenty dollars per month and as such I sell it to him for the above Eight dollars. Lake Creek April 9 - 1837 the said certificate attached to this sale of it. Texas State Library and Archives, Republic Claims, Name: Stewart, Charles B., Claim #: 960, Type: AU, Reel #: 126, Frames: 705-708. You can look these records up online at: http://www.tsl.state.tx.us/arc/repclaims/index.php James Wilson participated in the Siege of Bexar. His army discharge was signed November 24, 1835 by Captain Joseph L. Bennett. Wilson's discharge was counter-signed by then Commander in Chief and General, Stephen F. Austin. C. B. Stewart, always the business man, made an excellent bargain. He paid James Wilson $8.00 for his army discharge on April 9, 1837. On April 27, 1837, J. W. Moody, the First Auditor of the Republic of Texas, paid C. B. Stewart $31.33. Stewart as assignee of James Wilson, almost quadrupled his money in just two and a half weeks. April 21, 1837 was a very busy day in the Lake Creek District as will be seen in the following documents. Before me came A. U. Springer and said that the annexed discharges are original just and true- that he does not for himself or any other person owe anything to the Government he has not taken embezzled or retained any army ammunitions or horses mules or any other thing belonging to the Government nor has he caused the same to have been done by any other person excepting one 3 point Blanket at San Antonio. Texas State Library and Archives, Republic Claims, Name: Springer, A. U., Claim #: 953, Type: AU, Reel #: 99, Frames: 579-583. See the A. U. Springer League on the map above. The map has his middle initial wrong and shows A. W. Springer. The A. U. Springer League is located to the south of the location where Lake Creek empties into the West Fork of the San Jacinto River. Texas State Library and Archives, Republic Claims, Name: Springer, John, Claim #: 952, Type: AU, Reel #: 99, Frames: 585-588. Also see J. M. Springer above in 1834 Stephen F. Austin's Register of Families and in 1836 Deed John M. Springer to Jeremiah Worsham. Texas State Library and Archives, Republic Claims, Name: Rogers, Raleigh, Claim #: 954, Type: AU, Reel #: 89, Frames: 542-547. Raleigh Rogers was one of the original settlers who received his League from Stephen F. Austin in 1831. See the Rogers League on the map above located directly to the south of the Thomas Chatham land grant and John Corner League. ...of War, or any kind of property whatever belonging to the Republic of Texas; or caused the same to have been done. Sworn and Subscribed before me J Worsham J.P.
Texas State Library and Archives, Republic Claims, Name: Galbraith, George, Claim #: 955, Type: AU, Reel #: 34, Frames: 110-113. You can look these records up online at: http://www.tsl.state.tx.us/arc/repclaims/index.php See the land grants to George Galbraith on the map above. Texas State Library and Archives, Republic Claims, Name: Garrett, Dickerson, Claim #: 5432, Type: AU, Reel #: 34, Frames: 430-431. You can look these records up online at: http://www.tsl.state.tx.us/arc/repclaims/index.php See the land grants to George Galbraith on the map above. In a Joint Resolution passed by the Congress of the Republic of Texas and signed into law by President Sam Houston on December 17, 1836, the Chief Justice of each county in the Republic of Texas was required to provide a description of his county's boundaries to the Secretary of State by the first day of May, 1837. Beginning on page 926 of Annotated Civil Statutes of the State of Texas by John Sayles, 1894, Abilene, Texas, Published by The Gilbert Book Company in St. Louis Missouri; John Sayles and Henry Sayles transcribed the descriptions of each of the counties provided by the Chief Justice of each of the counties. Washington County Chief Justice, John P. Coles, provided the following description of the county boundaries of Washington County, Texas. His description of the boundaries of Washington County is very careful to specifically include a reference to "Lake creek settlement." lowing down said west bank to the county of Liberty (which is undefined); from thence following said line of Liberty to the northeast corner of the county of Harrisburg; from thence following the north line of the county of Harrisburg to the northeast corner of the county of Austin, so as to include Lake creek settlement; from said northeast corner of the county of Austin, following the north line of Austin, to the mouth of Ponn [Pond]creek on the east bank of the Brazos river; and thence up said east bank to the point opposite the mouth of Caney creek, and thence across the Brazos river to the place of beginning. See Annotated Civil Statutes of the State of Texas by John Sayles, 1894, Abilene, Texas, St. Louis Missouri, The Gilbert Book Company, pages 930-931. See Texas State Library and Archives, Republic Claims, Name: Dikeman, Cyrus, Claim #: 7983, Type: AU, Reel #: 124, Frame: 94. Matthew Moss was another volunteer who joined William Ware's San Jacinto Volunteers. Moss joined the Texas army on the day that the Alamo fell. Matthew Moss fought in the Battle of San Jacinto on April 21, 1836. This document and the one below were both executed on May 8, 1837. One was sworn to in the "Lake Creek Precinct" and the other was sworn to in the "Lake Creek District" showing how interchangeably the terms were used. On the 8th day of May Eighteen Hundred and thirty seven came Benjamin Rigby and says the annexed discharge is original just and true and he owes the Governmentnothing either for himself or any other person nor has he retained, sold or embezzled any arms munitions of war or any kind of property whatever belonging to the Republic of Texas or caused the same to be done. See the Texas State Library and Archives, Republic Claims, Name: Rigby, Benjamin, Claim #: 2613, Type: AU, Reel #: 88, Frame: 113. Benjamin Rigby executed his affidavit on the same day as Thomas Chatham below. Benjamin Rigby was one of the original settlers who received his League from Stephen F. Austin in 1831. See the Benjamin Rigby League on the map above directly west of the John Corner League and directly north of the Zachariah Landrum League. Special thanks to native Texan Rita Kern who discovered this reference to the District of Lake Creek in the affidavit of her ancestor Alexander Whitaker. This is another example of Jeremiah Worsham as the Justice of the Peace of the District of Lake Creek. Montgomery County Deed Book F, pp. 12-14. Just days before W. W. Shepperd and J. W. Moody would place the advertisement for the new town of Montgomery in the Telegraph and Texas Register newspaper, we see people executing a deed in a place that they are still calling Lake Creek. Witnesses to this deed were Charles B. Stewart, R. M. Cravens and George W. Davis. See Washington County Clerk, Deed Book A, pp. 175-177. This deed was executed on June 13, 1837 about three weeks before the town of Montgomery is founded in early July 1837. On June 13, 1837, the location where the town of Montgomery will be founded is still commonly described as the store of W. W. Shepperd on Lake Creek. See Washington County Clerk, Deed Book A, p. 177. Another legal document executed at "the store of W. W. Shepperd on Lake Creek." See Washington County Texas Court of Commissioners of Roads & Revenue 1836-1846, originally transcribed by the WPA, 2001, GTT Books, Indexed by Pat Gordon 2002, p. . A copy of Washington County Texas Court of Commissioners of Roads & Revenue 1836-1846 is now available in the Charles B. Stewart West Branch Library of the Montgomery County Memorial Library System in reference area for local historians and 7th grade Texas history students to use in their research. Prior to the July 8, 1837 advertisement in the Telegraph and Texas Register newspaper introducing the Town of Montgomery, the Town of Montgomery does not appear in the minutes of the Washington County Commissioners' Court. In early July, the area is still being called Lake Creek and Lake Creek Settlement. It is very important to note that a place called Montgomery does not appear in the Washington County Commissioners' Court minutes for the first time until October of 1837, three months after the town was founded. SITUATED in the county of Washington, sixty miles northwest of the city of Houston, thirty five miles east of the town of Washington, and six miles west of the San Jacinto River, in the centre of a high, beautiful and undulating district of country, distinguished for health, good water, and soil. It is expected that a new county will be organized, at the next session of congress, embracing this section of country. in which event, the town of Montgomery from its central position, must be selected as the seat of justice. The San Jacinto affords an excellent keel boat navigation to this point. The most direct route from the the city of Houtston to Robertson's colony and Red River settlements, and from Bevil's settlement to Washington, pass through this town. The great extent of good land lying contiguous, and its increasing and enterprising agricultural population, cannot fail of making this one of the most flourishing inland towns in this republic. Sales of lots at auction will take place in the town of Montgomery, on the first Monday in September ensuing, and continue for three days. Terms of sale, six, and twelve months credit. Notes with approved security will be required. Good titles will be made upon the payment of the first notes. J. W. Moody, }for company. See the Saturday, July 8, 1837 edition of the Telegraph and Texas Register, Vol. 2, No. 25, Whole No. 17, p. 3 published in Houston, Texas. As stated at the beginning of this article, this date is significant. The names "Montgomery" and "town of Montgomery" appear in print for the first time to describe a place in Texas in the July 8, 1837 edition of the Telegraph and Texas Register which was published in Houston, Texas. And we can date the founding of the original Town of Montgomery to this date. In this advertisement, W. W. Shepperd and J. W. Moody make a couple of surprising predicitions. They predict that a new county will be created in the next session of congress and that the town of Montgomery will be selected as the county seat of the new county. As we will see, both of these predictions will come true. For a while after this date, July 8, 1837, the terms Lake Creek Settlement, District of Lake Creek, Precinct of Lake Creek and Lake Creek will be used synonymously with the terms Montgomery and Town of Montgomery. The next two documents are examples of the "Lake Creek" and "Montgomery" terms being used interchangeably. Shortly thereafter, the terms Montgomery and Town of Montgomery will become the more popular names and Lake Creek Settlement, District of Lake Creek, Precinct of Lake Creek and Lake Creek will quickly fall out of common usage. Charles B. Stewart considered the Montgomery advertisement important enough to glue a copy of it onto the front inside cover of his Day Book from 1836 to 1852 . See bottom left of scan. See C. B. Stewart's Day Book from 1836 to 1852, Charles Bellinger Stewart Papers, Texas State Library and Archives, Austin Texas. Note C. B. Stewart makes no mention of any place called Montgomery in his Day Book from 1836 to 1852 prior to July 8, 1837. "...affect the goodness of this act. And I sign this act at the store of W W Shepperd on Lake Creek in the town of Montgomery on the 2nd day of August Eighteen hundred Thirty seven - and there being no Notary present I acknowledge..."
Washington County Clerk, Deed, Volume A, pp. 241-243. This wonderful deed is something of a Rosetta Stone. The District of Lake Creek and the store of W. W. Shepperd on Lake Creek and theTown of Montgomery are all the same place! This deed was signed on August 2, 1837 less than a month after the town of Montgomery was founded on July 8, 1837. This may be the earliest known deed referring to the town of Montgomery. All the names for Lake Creek Settlement will soon fade away being replaced with Montgomery, Town of Montgomery and County of Montgomery. August 12, 1837, edition of the Telegraph and Texas Register, Vol. II, No. 30, Whole No. 82, page 1, published by Cruger & Moore in Houston, Texas. Just over a month after the July 8, 1837 advertisement for the sale of lots in the town of Montgomery was first run, W. W. Shepard [Shepperd] is listed in the masthead of the Telegraph and Texas Register as the agent of the newspaper in "Montgomery, Lake creek." This was the first edition in which W. W. Shepperd appears as an agent of the Telegraph and Texas Register. He is the agent at Montgomery, Lake creek. Before the July 8, 1836 edition, the Telegraph and Texas Register used only the names Lake Creek or Lake Creek Settlement to designate the place. The name Montgomery had only been in use to designate the place since July 8, 1837 (a little over a month). The "Buchannon to Stewart" deed signed on August 2, 1837 (see above) uses the terms "on Lake Creek", "District of Lake Creek" and "Town of Montgomery" synonymously. Now, just a few days later, we see the Telegraph and Texas Register using the names Montgomery and Lake Creek synonymously. The Telegraph and Texas Register begins to use both names interchangeably right on the cover of the newspaper in its masthead. It appeared this way for months. See December 9, 1837 edition of Telegraph and Texas Register below. ...W. W. Shepard, Montgomery, Lake creek. The "Lake creek" name will be dropped from the Telegraph and Texas Register masthead shortly after the creation of Montgomery County on December 14, 1837. As an example, the January 8, 1840 edition of the Telegraph and Texas Register lists W. W. Shepard as agent in "Montgomery" only. The "Lake creek" is gone. On the 18th day of August 1837 Before me George Galbraith a Justice of the Peace for the District of Lake Creek Washington County in the Republic of Texas personally appeared James P McFarland who says the annexed discharge is original just and true, and that he owes the Government nothing for himself or any other person nor has he retained, sold or embezzled any arms, munitions of war, or any kind of property whatever belonging to the Republic of Texas or caused the same to have been done. See Washington County Texas Court of Commissioners of Roads & Revenue 1836-1846, originally transcribed by the WPA, 2001, GTT Books, Indexed by Pat Gordon 2002, pp. ,  & . The town of Montgomery was founded in July of 1837. As late as the October term of the Washington County Commissioners Court, the terms Lake Creek Settlement, District of Lake Creek and Lake Creek are still being used. At the October term meeting of the Washington County Commissioners' Court, the minutes will refer to Montgomery for the very first time. At the beginning of the October term meeting the terms Lake Creek, District of Lake Creek and Lake Creek Settlement are used. At the end of the October term meeting, the term Montgomery is being used. Creating the county of Montgomery. For primary source, see An Act Creating the County of Montgomery, 2nd Congress, Regular Session (1837), Texas Secretary of State, Archives and Information Services Division, Texas State Library and Archives Division. Joseph Rowe, the Speaker of the House of Representatives, who signed the Act creating Montgomery County, and W. W. Shepperd had an additional connection. Joseph Rowe and W. W. Shepperd were both "Agents" for the Telegraph and Texas Register newspaper. Rowe was the agent in San Augustine and Shepperd was the agent in Montgomery, Lake creek. For a primary source see the December 9, 1837 edition of the Telegraph and Texas Register published at Houston, Texas 5 days before the Act creating Montgomery County was signed. Note: All the documents that follow are all dated after the creation of Montgomery County on December 14, 1837. All persons are hereby cautioned against purchasing or trading in any way for a head right of J. J. Smith, as I have purchased and paid for the same. JOHN PYLE. See December 30, 1837 Telegraph and Texas Register, Vol. 3, No. 3. See Texas State Library and Archives, Republic Claims, Name: Cooke, Francis J., Claim #: 4066, Type: AU, Reel #: 20, Frame: 325. Francis J. Cooke fought in the Battle of San Jacinto. Not only does this document mention Lake Creek, but it is example of a resident of the Lake Creek Settlement referring to C. B. Stewart as "Doct Stewart" and "the Doctor." For another example, see the "1838 Mary Corner Advertisement" below. "The president placed before the board the written act of donation of W. W. Shepperd to the County of Montgomery of an equal half undivided interest in the Town of Montgomery and Sixty acres of pine land adjoining - donated for County purposes and being put to question whether said donation should be accepted it was unanimously received - and the question being also whether the place of the Town presented by C. B. Stewart as agent for W. W. Shepperd should be received the same was also unanimously received and adopted." These are the original hand written minutes of the Montgomery County Commissioners Court found on page 1 located in the Montgomery County Clerk's Office in Conroe, Texas. Also see Montgomery County Clerk, Deed, Vol. E, p. 285. Following the creation of Montgomery County in 1837, the town of Montgomery was the county seat of an extremely large county. In her book, Melinda Rankin noted that (prior to the creation of Grimes County and Walker County) Montgomery County was so large that it was larger than the State of Delaware. Montgomery was at one time the local seat of government of a territory larger than the State of Delaware, extending from the San Antonio road (the old "king's pass" of the anti-Texan era) on the north, to Spring Creek on the south, and from the Brasos on the west, to the Trinity river on the east, some seventy miles on either course - and now containing the counties of Grimes, Walker and Montgomery. See page 145 of Melinda Rankin's book,Texas in 1850, printed in Boston by Damrell & Moore in 1850. Seat of Justice for Montgomery county, For Sale. A Sale of Lots in the town of Montgomery will take place on the premises, on the 4th Monday of April instant. Terms made known on the day of sale. By order of the County Commissioners. This advertisement ran at least three times. See the April 14, 1838, April 18, 1838, and April 21, 1838 editions of the Telegraph and Texas Register newspaper published in Houston. Some time between the first Montgomery County Commissioners Court meeting on March 1, 1838 and April 30, 1838 elections were held in Montgomery County. On April 30, 1838, Jesse Grimes provides Robert A. Irion, the Secretary of State of the Republic of Texas, the election returns below. In the organization of the County of Montgomery the following named persons were duly elected To Wit: Abram Zuber Clerk of district Court, Gwyn Morrison Clerk of County and Probate Courts, Joshua Robbins Sheriff, Daniel Quinby Coroner, Daniel T. Dunham, Zoraster Robinson, Hillory M. Crabb, Luther M. T. Plummer, Martin P. Clark and George Galbraith Justices of the Peace for said County, all of whom have been duly qualified and are acting in their official capacities respectively. Texas State Library and Archives, Republic of Texas Election Returns 1835-1845, Box 2-9/44, Election Returns 1838- Montgomery Co. There was some miscommunication and Jesse Grimes re-submitted the returns to the Secretary of State on May 30, 1838. These returns are more detailed. The County of Montgomery was organised as early as practicable after receiving the proclamation of the President on that subject. One of the Justices elect having been a while absent from the County the returns of his qualifications was not received until the April term of the Probate Court, when I immediately made return of all the County Officers, with the exception of Constables to the Department of State which I hope you have received but for fear it has not reached you I have sent you another which I have to do from memory being at home sixteen miles from the County Clerks office. Abram Zuber Clerk of the district Court; Joshua Robbins Sheriff Daniel Quimby Coroner. For the precinct of Viesca D T Dunham and Zoraster Robinson Justices of the peace and Peter Tumbleston Constable. Precinct of Lake Creek Martin P Clarke and George Galbraith Justices of the Peace and William S. Taylor Constable. Precinct of San Jacinto Hillory M Crabb and Luther M Plummer Justices of the Peace and Constable. Texas State Library and Archives, Republic of Texas Election Returns 1835-1845, Box 2-9/44, Election Returns 1838 - Montgomery Co. Jesse Grimes provided some additional election returns on October 30, 1838. Martin P. Clarke and George Galbriath were elected Justices of the Peace for the Precinct of Lake Creek and William S. Taylor was elected the Constable of the Precinct of Lake Creek. Above is the 1936 Texas Centennial Marker honoring William S. Taylor located in the "Old Cemetery" in Montgomery, Texas. September 29, 1838, edition of the Telegraph and Texas Register, Vol. IV, No. 5, Whole No. 161, page 3, published by Frances Moore, Jr. in Houston, Texas. Not only does this advertisement mention Lake Creek but it also refers to "Dr." Stewart. Texas State Library and Archives, Republic of Texas Election Returns 1835-1845, Box 2-9/44, Election Returns 1838 - Montgomery Co. The three precincts in Montgomery County in 1838 identified in these election returns are the Precinct of Viesca, the Precinct of Lake Creek and the Precinct of San Jacinto. In 1839, these three very large precincts were replaced with a number of political subdivisions called beats. For some reason, William S. Taylor ceased to be the Constable of the Precinct of Lake Creek as evidenced by the election of Nathan Drake in November of 1838. The earliest elections records in Montgomery County were recorded in a small book in the County Clerk's Office called Records of Official Bonds 1838-1848. This book is great primary source for the names and offices held by the earliest officials in Montgomery County. On page 12, we find the election of Nathan Drake as the Constable of the Precinct of Lake Creek. Know all men by these presents that we Nathan Drake, W. W. Shepperd and Charles Garrett are held and firmly bound unto Sam Houston, President of the Republic of Texas and his successors in office in the just and full sum of One Thousand Dollars good and lawful money for the payment whereof we bind ourselves, our heirs executors and administrators, jointly and severally, firmly by these presents. Sealed with our seals and dated the 25th day of November A. D. 1838 and third year of the Independence of the Republic of Texas. Now if the said Drake shall faithfully perform all the duties that are or shall be required of him by law as Constable of said Precinct then the above obligation to be void. Otherwise to be and remain in full force and effect. Approved the 26th November 1838. The sureties on Constable Drake's bond were W. W. Shepperd and Charles Garrett; and Montgomery County Chief Justice Jesse Grimes approved the bond. Special thanks to Vera Meek Wimberly for abstracting Records of Official Bonds 1838-1848 which included the information about Constable Nathan Drake. See page 110 , Vol. 13, #3, Fall 1990 edition of The Herald, article entitled Montgomery County Texas Official Bonds 1838 - 1848. Special thanks to Sharon Wilson and the rest the Montgomery County Clerk's Office for the great job in locating this wonderful primary document from the first year of the county's existence. Know all men by these presents that I William Atkins of the said County of Montgomery and Republic of Texas aforesaid am held and firmly bound unto Allen Samuel of said County and Republic aforesaid in the just and full sum of Twenty five hundred Dollars current money of this Republic of the value of gold or silver dollars for dollars to the payment of which I bind myself my heirs executors and administrators jointly and severally, firmly by these presents signed and sealed this 5th day of August in the year of our lord one thousand eight hundred and thirty nine. Montgomery County Clerk, Deed, Vol. E., pp. 219-221. The date of this title bond is August 5, 1839. The term District of Lake Creek is still in use in 1839. The witnesses were Geo. Galbraith and James Corner. The Stoner survey mentioned here is a reference to land that Lewis Stoner purchased from William Atkins earlier January 19, 1839. See Montgomery County Clerk Deed Vol. E, pp. 288-290. William Atkins was one of the original settlers who received his Mexican land grant from Empresario Stephen F. Austin in 1831. The William Atkins League is located just southeast of the John Corner League. Click here to see a map showing the location of the William Atkins League. Methodist conference meetings were held at a different location in the Montgomery Circuit each quarter. At the third quarterly conference meeting of the Methodist Episcopal Church's Montgomery Circuit held Saturday, September 26, 1840, a vote was taken as to where the next quarterly meeting should be held. The Lake Creek Settlement was chosen as the site of the December 1840 quarterly conference meeting. Question 4th where shall the quarterly meeting be held. See the "Journal of the church conference held at Montgomery 1839-1850" located in the Oscar Murray Addison Papers in the Dolph Briscoe Center for American History at the University of Texas at Austin [formerly the Barker Texas History Center] in Box 2A103. See the "Journal of the church conference held at Montgomery 1839-1850" located in the Oscar Murray Addison Papers in the Dolph Briscoe Center for American History at the University of Texas at Austin [formerly the Barker Texas History Center] in Box 2A103. When the quarterly conference meeting was held in the Lake Creek Settlement in December of 1840, the meeting was held in a building referred to as the "Lake Creek Meeting house." This is the first and only reference to this building that has been located to date. The following letter was written by Cyrus Dikeman regarding Sam Houston's Presidential re-election chances in 1841. Mr. Dikeman a very repectable and intelligent settler of Montgomery county, under date of July 27th, writes as follows"
Dear Sir: - From what I can hear, the impression has gone abroad, that Gen. Houston will get all the votes in this county, and knowing this to be an error and believing that is calculated to prejudice the election of Judge Burnet, I conceive it to be my duty to inform you that unless I am greatly mistaken Judge Burnet will get at least 200 votes in this county - a majority of the respectable farmers will vote for Judge Burnet. See August 11, 1841 edition of the Telegraph and Texas Register newspaper, Vol. 6, No. 37, page 3. Even after July 8, 1837, the area around the Town of Montgomery was still known as the Lake Creek Settlement for some time. July 2, 1845 edition of the Montgomery Patriot, Vol. 1, No. 10, page 4, published by John Marshall Wade in Montgomery, Texas. Click here to see a scan of the original advertisement. The fact that the area around Montgomery was known as Lake Creek or the Lake Creek Settlement cannot be disputed. Above is an advertisement published in the July 2, 1845 edition of the Montgomery Patriot newspaper published by John Marshall Wade. The advertisement placed by A. M'Cown (Alexander McCown) is for the sale of lots in the Town of Montgomery. In describing Montgomery, the advertisement describes, "The lands surrounding Montgomery known as the Lake Creek Settlement, being of such a rich and fertile character..."
Alexander McCown was the brother and agent for James McCown. In 1839, James McCown had purchased W. W. Shepperd's equal half undivided interest in the Town of Montgomery as well as the two hundred acres due north of the town for $4,000.00. It is interesting to take note of John Marshall Wade's motto in the newspaper masthead, "Let all the ends thou aim'st at be thy Country's, thy God's, and Truth's"
John Marshall Wade attained the rank of Colonel during the Texas Revolution and manned the "Twin Sisters" cannons during the Battle of San Jacinto on April 21, 1836 when Texas won its independence from Mexico. District Court To Jacob Shannon or your Attorney of record A Hemphill Esq. Take notice that Plaintiff will apply to the Clerk of the District Court of said County for a commission to take the answers of Jesse Grimes a witness residing in Grimes County to the following Interrogatories. The Depositions to be used by Plaintiff in a certain cause now depending in said Court No 923, wherein Ruth Miller is Plaintiff and you are Defendant. Interrogatories by Plaintiff to be propounded to Jesse Grimes a resident of Grimes County. Int. 5th In, or previous to, 1833 did you know of a League of Land in Lake Creek Settlement known or called Beadye League? If yes what name has it now and whose Leagues does it adjoin; and what name has it now? Montgomery County District Court, Case No. 923, Montgomery County, Texas. Here, Attorney Nat Hart Davis propounds an Interrogatory on Jesse Grimes which presumes the existence of the Lake Creek Settlement. He is asking about the Beadye League. The Beadye League was the League that Jacob Shannon received from Empresario Stephen F. Austin in 1831. The Beadye League was later known as the Jacob Shannon League. Click her for more information about Nathaniel Hart Davis and the N.H. Davis Pioneer Complex and Museum in Montgomery, Texas. Cross Question 34th Had he [Jacob Shannon]made much property before Ruth Miller came to lake creek settlement? Cross Question 49th How long had Jacob Shannon been living in lake creek settlement before Ruth Miller came? Cross Question 50th How long had your Father [Jacob Shannon]been here? how long had your Grand Father Shannon [Owen Shannon]been here? Cross Question 56th When your father [Jacob Shannon]moved to lake Creek Settlement near the present town of Montgomery was not Jacob Shannon the poorest one of the Shannon men? Cross Question 57th When was the last Time you saw the alleged or pretended instrument asked about in the 5th direct Interrogatory? Who was then & there? See Ruth Miller vs. Jacob Shannon, Montgomery County District Court, Case No. 923, Montgomery County, Texas. Here, Nathaniel Hart Davis propounded three Cross Interrogatories on William Shannon on June 15, 1857 which presumed the existence of the Lake Creek Settlement. Nathaniel Hat Davis was an early attorney and later a Judge in Montgomery, Texas and Montgomery County, Texas. The N. H. Davis Pioneer Complex & Museum is the site where the Lake Creek Settlement Texas Historical Commission marker will be placed. Texas State Library and Archives, Republic Claims, Name: Wade, John M., Type: PE, Reel #: 243, Frames: 524-526. As has been noted previously in this article, John Marshall Wade published a newspaper in Montgomery , Texas during the Republic of Texas called the Montgomery Patriot. Thomas Chatham lived in the Lake Creek Settlement from 1834. Here in his own sworn statement he leaves no room for doubt when he says he knew John M. Wade in 1835 at,"the place then called Lake Creek Settlement now the town of Montgomery." Chatham follows this statement with another, "he [Wade]returned to the Lake Creek Settlement now the county and town of Montgomery..."
John Marshall Wade and Thomas Chatham joined William Ware's company in the Lake Creek Settlement in October of 1835. Capt. William Ware went west and founded the town of Waresville in the early 1850's in what is today Uvalde County, Texas. ...[sic] seventeen days longer, and [sic] all probability of a re invasion was at an end that he then returned to his place of residence in Montgomery County then called Lake Creek Settlement in the Municipality of Washington now the County of Montgomery..."
Texas State Library and Archives, Republic Claims, Name: Cartwright, Mathew, Type: PE, Reel #: 207, Frame: 596. After describing his extensive military activities in 1835 and 1836, Mathew Cartwright swore "that he then returned to his place of residence in Montgomery County then called Lake Creek Settlement in the Municipality of Washington now the County of Montgomery..." Mathew Cartwright fought in the Battle of San Jacinto. Texas State Library and Archives, Republic Claims, Name: Cartwright, Mathew, Type: PE, Reel #: 207, Frame: 597. John Marshall Wade had been the publisher of the Montgomery Patriot newspaper in the town of Montgomery during the 1840's. See advertisement in the July 2, 1845 edition above. John M. Wade knew exactly where the Lake Creek Settlement had been. John M. Wade was elected the Surveyor of Montgomery County in 1840. See page 23 of Records of Official Bonds 1838-1848 located in the Montgomery County Clerk's Office. "And Jacob Shannon says that he is a resident citizen of Montgomery County and has resided in what is now said County from the year 1830 to the present date, that he knew the said Mathew Cartwright now present before him, in the year 1835 at and in Lake Creek Settlement now said County of Montgomery that he also knew him in the Army of Texas in the Campaign at San Antonio de Bexar in the year 1835 that he went from said Settlement in company with himself as members of Capt Fosters company under Capt Jos L Bennet (Foster having resigned)..."
Texas State Library and Archives, Republic Claims, Name: Cartwright, Mathew, Type: PE, Reel #: 207, Frame: 598. Jacob Shannon mentions "Capt Fosters company." Jacob Shannon is referring to James J. Foster. See Foster's land grant in relation to the other land grants in the Lake Creek Settlement on the map above. It is just north and east of the Owen Shannon League. James J. Foster was the original army recruiter in the Lake Creek Settlement for the Republic of Texas. This same James J. Foster also witnessed the signing of Owin Shannon's will shortly before Owin Shannon's death. Texas State Library and Archives, Republic Claims, Name: Corner, Evin, Type: PE, Reel #: 210, Frames: 265 and 266. Texas State Library and Archives, Republic Claims, Name: Rankin, Elvira, Type: PE, Reel #: 234, Frames: 486 and 487. Special thanks to siblings Mary Buller and John Harris who located this document and brought it to our attention. Mary and John are descendants of the Rankin family whose roots run very deep in the history of Texas. Lake Creek Settlement resident and Montgomery town founder, W. W. Shepperd, is also remembered today with a street named in his honor. Shepperd Street is located just west of Cedar Brake Park in Montgomery, Texas.